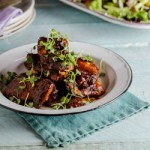 When I saw this recipe on one of my favourite blogs, Souvlaki for the Soul, a while ago, I knew I’d be giving it a go soon. I was just waiting for a cold day where the only comfort can be found in a bowl filled with delicious food. 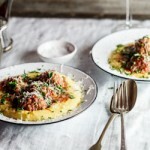 This recipe combines two of my absolute favourite things; Meatballs and soft polenta. 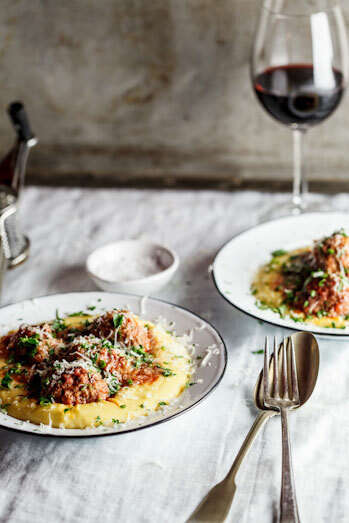 I am a little obsessed with Polenta and I try to make use of this simple, versatile ingredient as much as possible during the colder months. 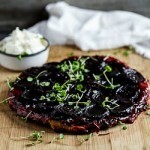 It is perfect served with saucy, meaty dishes. I’ve heard a lot of people saying they don’t like polenta because of the texture and this is simply because they have not used enough liquid and they haven’t cooked the polenta for long enough. 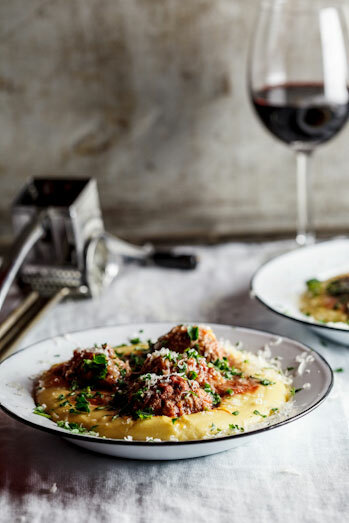 When undercooked, polenta will be quite grainy but when cooked properly, the grains are allowed to swell fully and the texture is rich, creamy and scrumptious. For the meatballs, I used the same recipe as for my Cheesy Meatballs baked in tomato sauce but left out the cheese as I wanted to top the finished dish with lots of grated Pecorino and fresh parsley. The end result was a delicious bowl of comfort food, perfect for the colder months. I made over mashed potatoes and it was delicious. This really didn’t work for me. The tomato sauce didn’t thicken much at the low temperature and the polenta was very runny. In the end, I cooked it for 30 minutes and eventually gave up and served the meatballs with pasta. What did I do wrong? It could be that the tomatoes you used were very liquidy, which would explain it not thickening. Different brands of polenta can sometimes behave differently. This is meant to be a softer consistency but definitely not runny. Add more polenta next time and it will firm right up. Would it be possible to prep and freeze the meatballs like a few weeks ahead of time? If so, would you make any adjustments to the recipe or cooking times? Yes, of course. I would cook them from frozen and would add around 10 minutes to the cooking time. 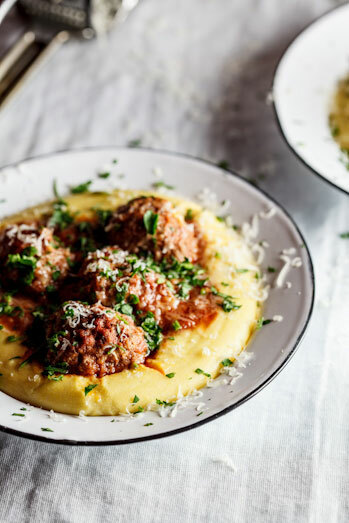 The sauce might get a little watery from the frozen meatballs so you might want to simmer it uncovered to reduce a little. 400g tomato paste??? wouldn’t it be too much for 500g miced meat? Purée, not paste. Tomato purée is similar in consistency to passata. It’s much milder than tomato paste. I don’t know where the polenta went wrong.. It was too damn liquidy! Was I was supposed to let the milk and stock boil and then add the polenta then let it simmer? Also saying to cube it first would have helped! Gvela, did you use ready-cooked polenta? The polenta I used in this recipe did not need to be cubed as it is in raw form (almost like grits if you are from the States). And yep, you bring the milk and stock to a simmer and then whisk in the polenta before allowing it to cook until thick. Yes, Polenta and corn meal are pretty identical. I have to try polenta like this. I’ve only ever had Polenta that other people made, and it was horrible. I couldn’t understand why people would eat it. For me it tasted as if I was eating pap straight out of the packet. Yum this looks divine. 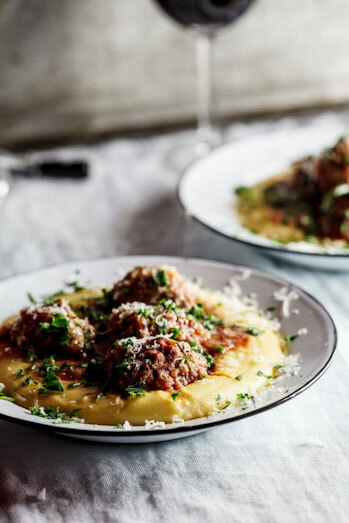 Never though to serve meatballs over polenta but it makes perfect sense now! Brooke, it is simply perfection. Such comfort food! Kelly, it isn’t. I like to leave it uncovered because the sauce gets to reduce and become rich and delicious.